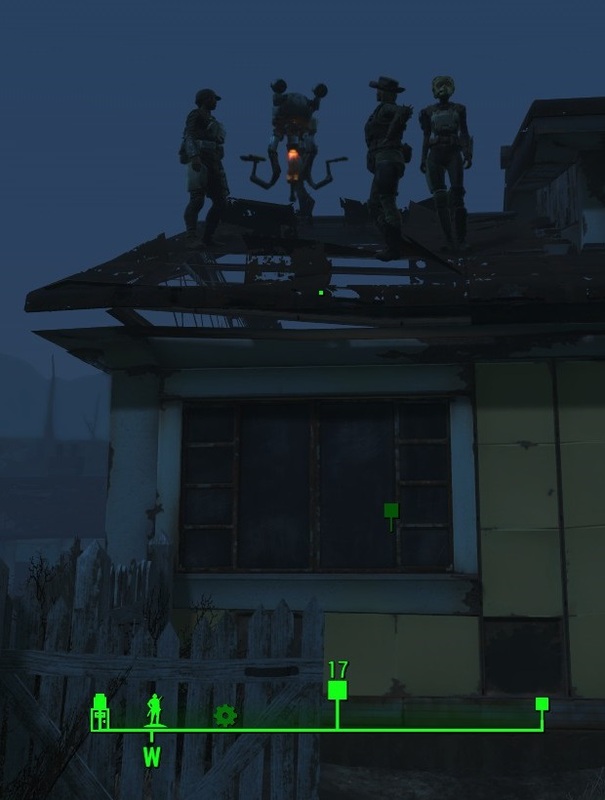 In Fallout 4, my Sanctuary Hills settlement has suddenly started having this problem where some of my settlers and Codsworth decide to throw a party on top of one of the abandoned buildings. They don't do anything but stand there. Clearly it's a glitch. Googling has suggested a "spring cleaning" mod to remove the building entirely (it's the one that has the workshop in the driveway). I placed a ladder against the side of the building and carefully climbed up (the roof is mostly holes), but while I can happily go up, my settlers will not come down. They really like hanging out of top of this roof apparently. How can I get my settlers to come down without using mods? I'm open to console commands, but I'm trying to finish my first play through "vanilla" before installing any mods. As a side note, this only recently happened after I fought off a super mutant attack at the settlement. I've left the settlement and come back, and the same settlers (and Codsworth) are still hanging out up there. The screenshot is the exact location of where I've propped the ladder, but they're just ignoring it. Here's the easy way. Looking at them (the way you are now), open the console. With the console open, click on one of them to select them and type into the console moveto player. Press Enter and it will teleport the selected NPC to you (you'll have to close the console for it to take effect). Do the same for each NPC up there. There are many ways to get these people off the roof. create stairs and wait for them to get off or go to sleep. create stairs and add food, or create a scavenging station, or create a shop nearby. Assign each settler to any of those. create stairs and create a bell to call settlers nearby. Ring the bell to call the settlers. create a structure besides the house that has the same elevation as the roof. Place a roof over it and add a tv and sofa in front of the tv. Connect the structure to the roof or create stairs to get onto it. Wait for them to go and watch tv. create a drink stand far away from the house. Assign a settler to it. They will go there on their own before the end of the day. Make stairs and then assign a settler to it. As soon as one settler goes down to do their job, Assign a different one to it. It saves resources. How to get more settlers in my settlements in Fallout 4? How to make the settlers STEAL my stuff? Can you assign named settlers to anything specific?